“I had been working as a dentist for about five years when I decided to take a break and go travelling. I spent 14 fabulous months journeying through South America. Twenty-hour bus rides between destinations were not uncommon and that gave me plenty of time to think about my future. Jewellery-making had always held a fascination for me so I decided to embrace it. “I started by watching jewellery-making videos on YouTube and reading books online while I was travelling. When I was in Mexico, I signed up for a two-week introduction to a silversmithing course. The funny thing was that I felt like I knew how to make jewellery before I ever touched a piece of silver. “When I returned home, I worked part-time in dentistry and started making jewellery on my days off. It served as a mindfulness exercise, taking my mind off work and giving me another focus in my life. I moved back in with my parents, turned their study into a jewellery studio and enrolled in a few more jewellery courses so I could expand on my self-taught skills. 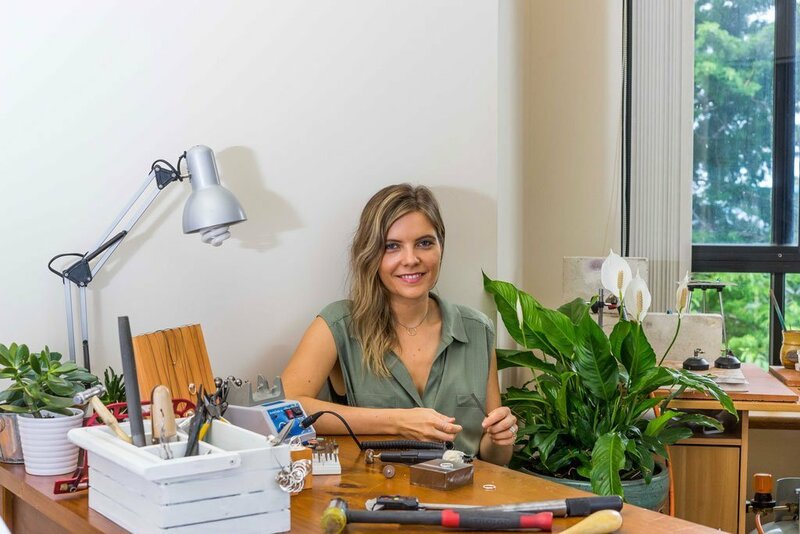 “Within the first year I had sold at many markets around New South Wales and started a website and online shop. I felt there was a big gap in the jewellery market—it’s either high-end pieces that cost a fortune or cheaply manufactured low-cost junk. I wanted my jewellery to sit somewhere in the middle. “So I started 100 of One. I only make a maximum of 100 pieces of each design. When it’s sold out, it’s all gone. You’re not going to see everyone walking around with one of my designs. “I mainly make earrings, necklaces and rings, along with some custom work and collaborative projects. One of the things I’m known for is to custom-make earrings to suit individual ear lobes. I always ask clients to send me a photo of their ears before I start designing their earrings—you can’t get any more custom-made than that! Visit Dr Nikolovski’s jewellery website at 100ofonejewellery.com.au or her Instagram page: @100of.one.jewellery. So wonderful to see you continuing to succeed in this project of passion, Jana! Thank you for setting such an important example about practising mindfulness and truly striving for work-life balance. ?